Born and raised in Sweden, Adam spent many years in Florida growing up. A dream to go to high school or college in the United States was always on his timeline. This dream became a reality when Adam joined the Men's Soccer team at Florida Southern College in 2010, pursuing a degree in Business Administration with a focus on Marketing Management. Shortly after graduating in 2014, Adam joined the Lakeland Area Chamber of Commerce, one of the largest chambers in Florida with 1,500+ members. Working under two departments: Membership Development and Communications & Marketing, Adam got thrown into a position with a lot of responsibility and excelled during his time at the Chamber coordinating events, creating marketing campaigns, running social media and making sure the members were happy and satisfied with their services. 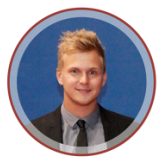 Adam is currently pursuing his Masters Degree in Management at Stockholm University, Sweden. Due to his yearning desire to succeed and his unadulterated passion for reaching his goals, he is beat out by no one to be a part of Be Robin Hood's foundation. Adam loves to spend time with friends, play soccer, fish and simply relax. Contact Adam here.